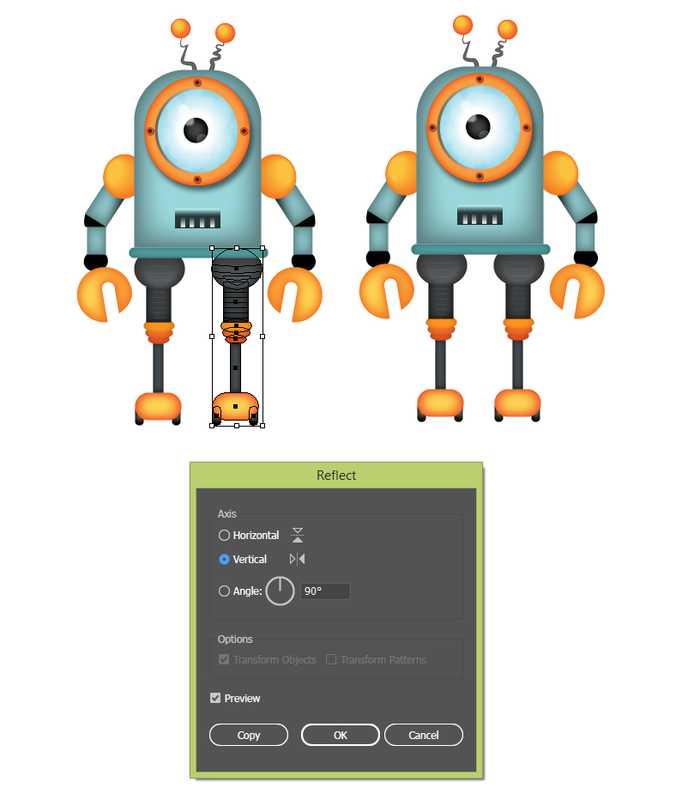 In this new tutorial you will learn how to create a friendly robot character in Adobe Illustrator. 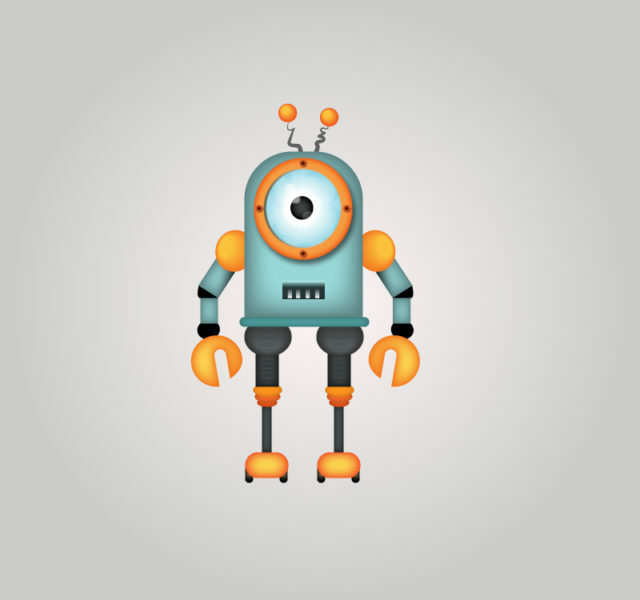 We will use mainly basic shapes, gradients, blends and effects to make it as cute as possible. Let’s start the fun! Launch Illustrator and go to File > New in order to open a blank document. Type a name for your file and set up the dimensions then select Pixels as Units and RGB as Color Mode. Next, go to Edit > Preferences > General and set the Keyboard Increment to 1 px and while there, also go to Units and make sure that they are set as in the following image. I usually work with these settings and they will help you throughout the drawing process. 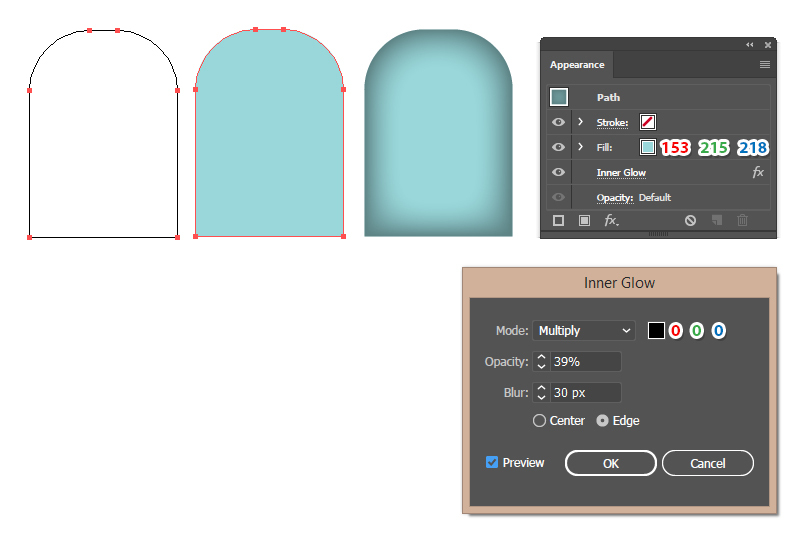 Take the Rounded Rectangle Tool, click on your artboard and enter the dimensions shown to draw the first shape. Now, use the Direct Selection Tool (A) to select only the two points at the bottom and press the Delete key on your keyboard to delete them. Close back the shape by selecting both end points and press Control-J to join them. 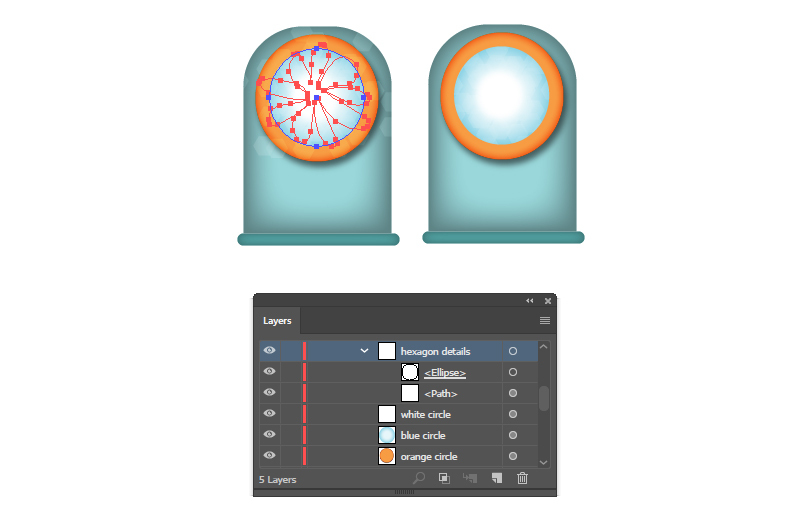 Color the new shape with light blue and then go to Effect > Stylize > Inner Glow and apply the settings shown. This will be the body of the robot. 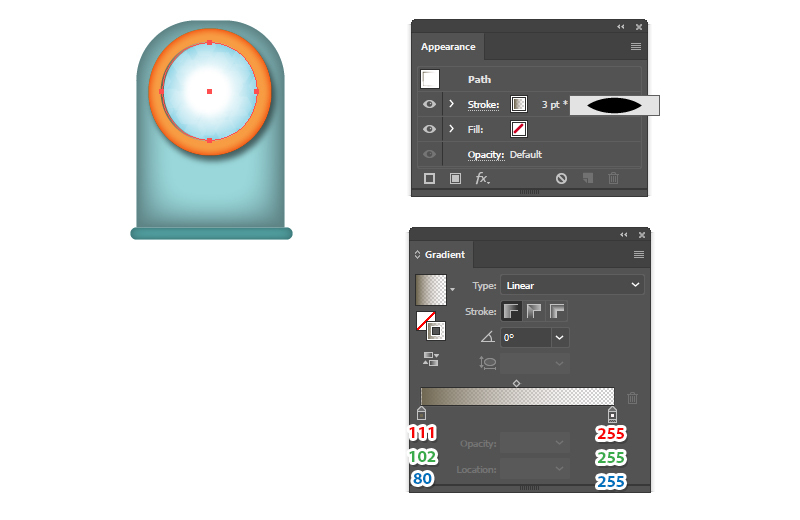 Use the Rounded Rectangle Tool again to draw a thin rectangle at the bottom of the body. Color it with blue and then apply the Inner Glow effect. 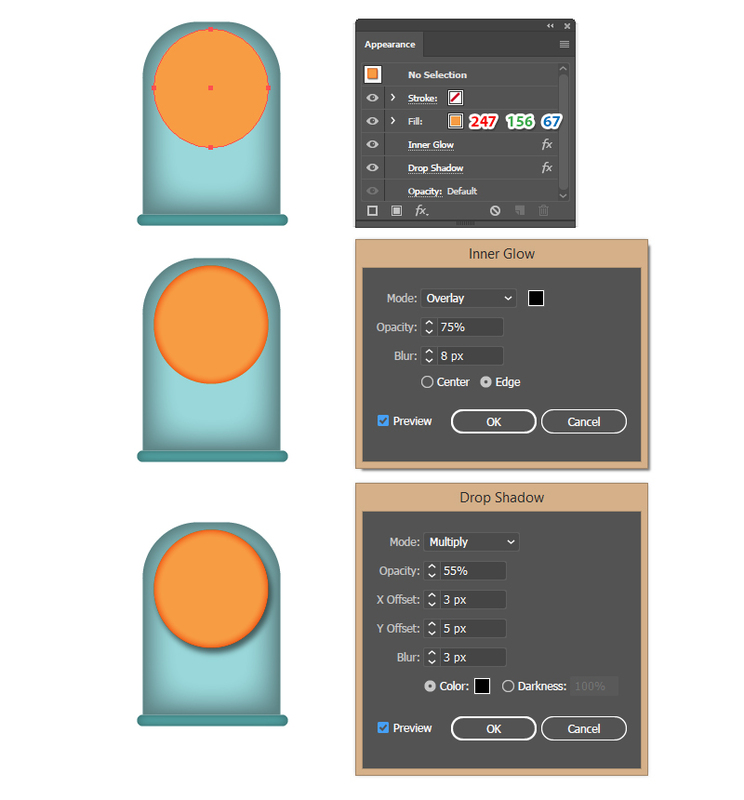 Next, take the Ellipse Tool (L) and draw an ellipse of about 123 x 127 px filled with orange. 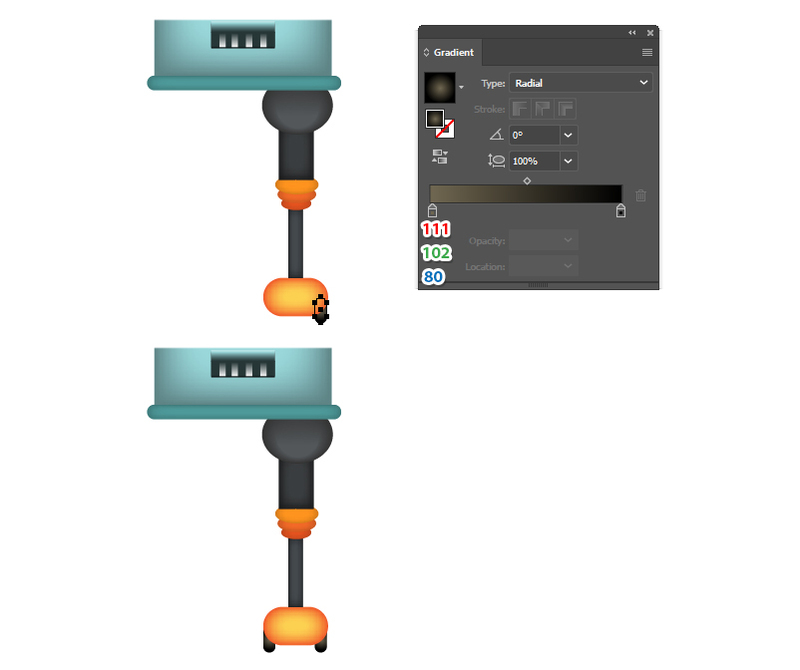 Go to Effect > Stylize > Inner Glow and then to Effect > Stylize > Drop Shadow and apply the settings shown. Use the Ellipse Tool (L) again to draw another ellipse of about 95 x 98 px. Arrange it in the center and color it with light blue. 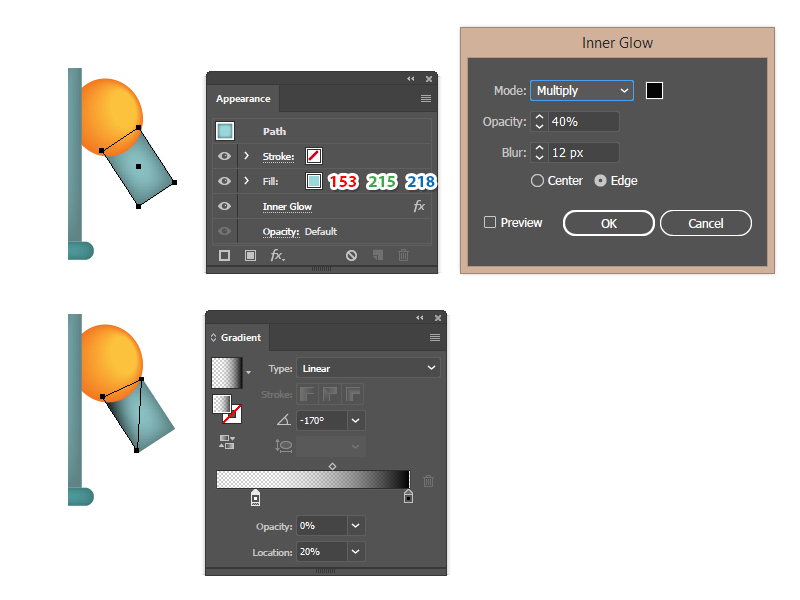 Go to Effect > Stylize > Inner Glow and apply the settings shown to create a highlight in the middle. Draw a smaller ellipse in the center of about 45 x 47 px and color it with white. Apply a 3 px Gaussian Blur. 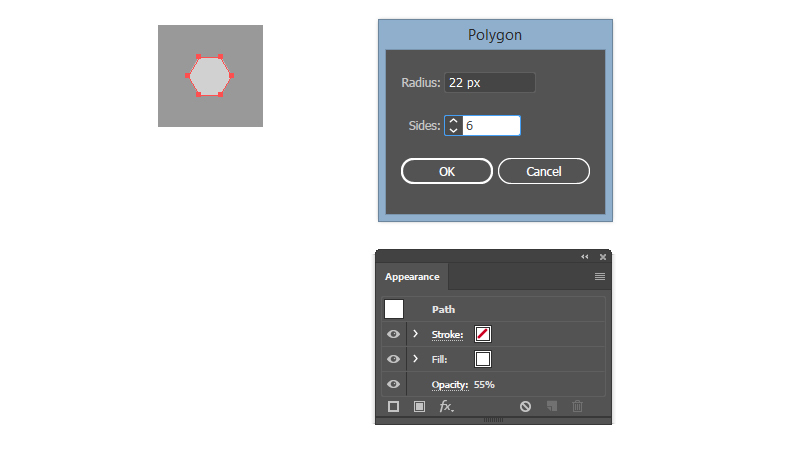 Take the Polygon Tool, click on your artboard and enter the dimensions shown to draw a small hexagon. Color it with white and reduce the Opacity to 55% to make it semi-transparent. 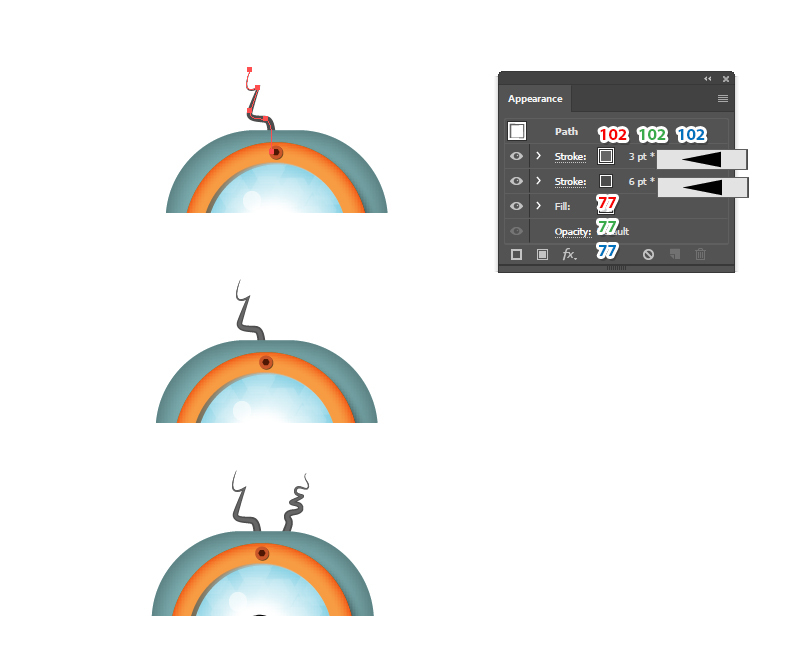 Drag the hexagon into the Brushes panel and save it as a New Scatter Brush. 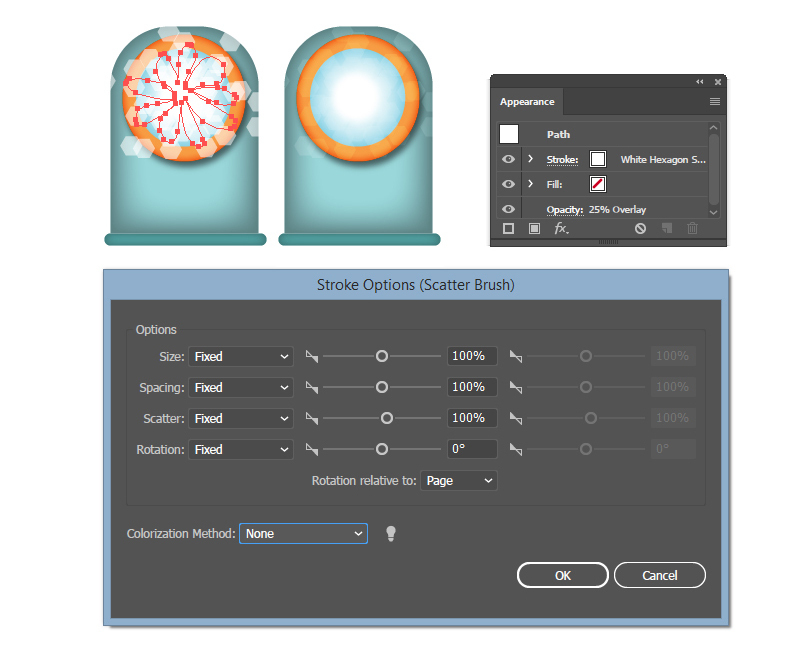 In the Scatter Brush Options window, type “White Hexagon Scatter Brush” as the name of the brush and leave the rest of the settings as they are. 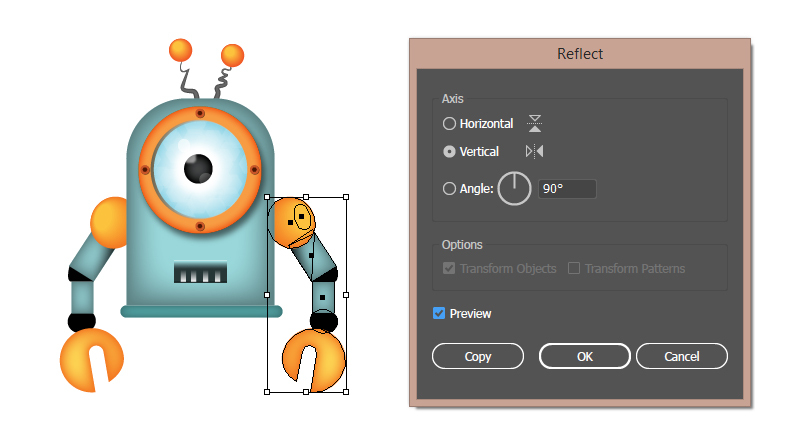 Hit OK.
Take the Pencil Tool (N) and draw a flower-like path that covers the eye of the robot. Select a 0.5 pt white Stroke and also the newly saved White Hexagon Scatter Brush from the Brushes panel. 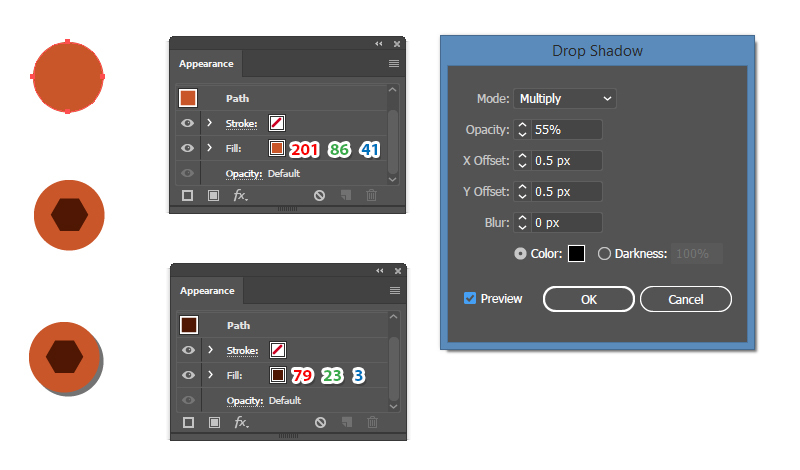 Open the Stroke Options window from the Appearance panel and set the Scatter value from 0% to 100%. Hit OK. Change the Blending Mode to Overlay and reduce the Opacity to 25%. Now, select the blue circle and then Copy and Paste in Place (Shift-Control-V) to make a copy of it in front of everything. Set this copy to stroke-none and fill-none (the blue path). Keep this copy selected and also select the flower-like path and go to Object > Clipping Mask > Make (Control-7). Copy and Paste in Place (Shift-Control-V) the blue circle again. 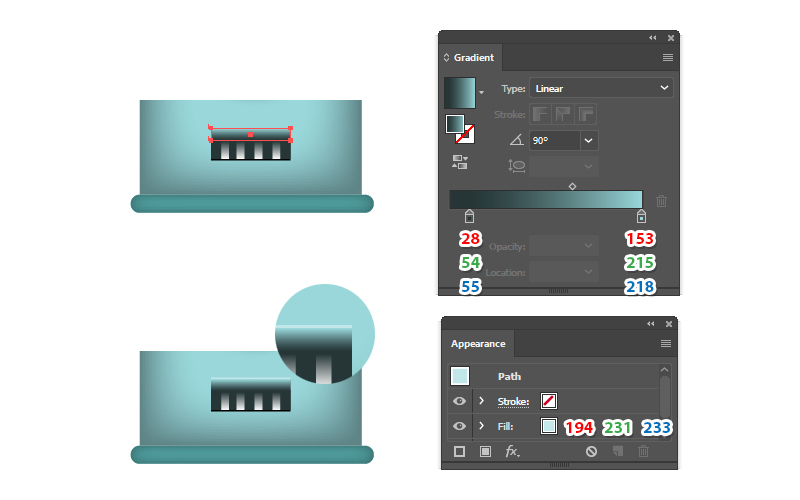 Remove the existing appearances from the Appearance panel and select a 3 pt Stroke and the Width Profile 1 in Stroke panel. Use the linear gradient shown where the white slider is set to 0% Opacity. Use the Ellipse Tool (L) to draw an ellipse of about 28 x 29 px as the pupil and color it with black. 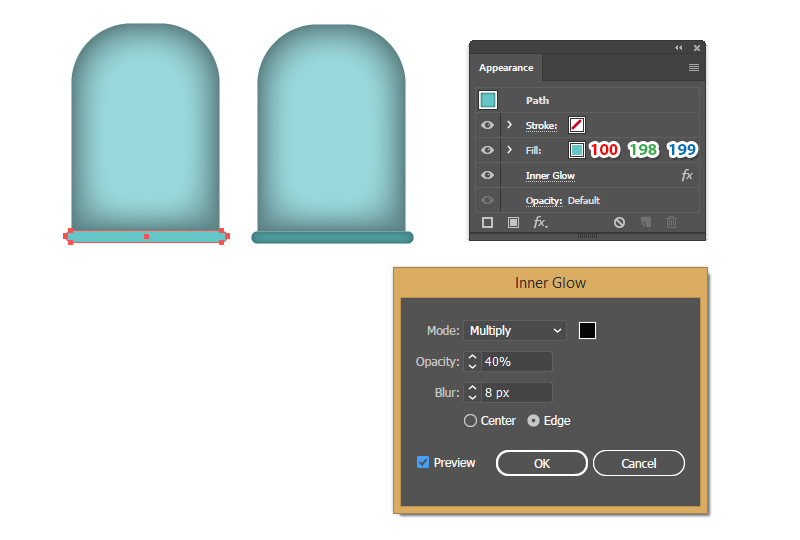 Next, go to Effect > Stylize > Inner Glow and apply the settings shown to create a highlight in the center. To add some sparkles in the eye, draw three small circles in the upper left side and bottom right side of the pupil. Color them with white and reduce the Opacity to 55% and 20%. You can see the result in the image below. Draw a small 9 x 9 px circle with the Ellipse Tool (L) and color it with brick red; then draw a small hexagon in the center with the Polygon Tool and color it with dark brown. Group (Control-G) these two shapes and then go to Effect > Stylize > Drop Shadow and apply the settings shown. Make three copies of the screw that you have created in the previous step and arrange them on the orange circle around the eye. 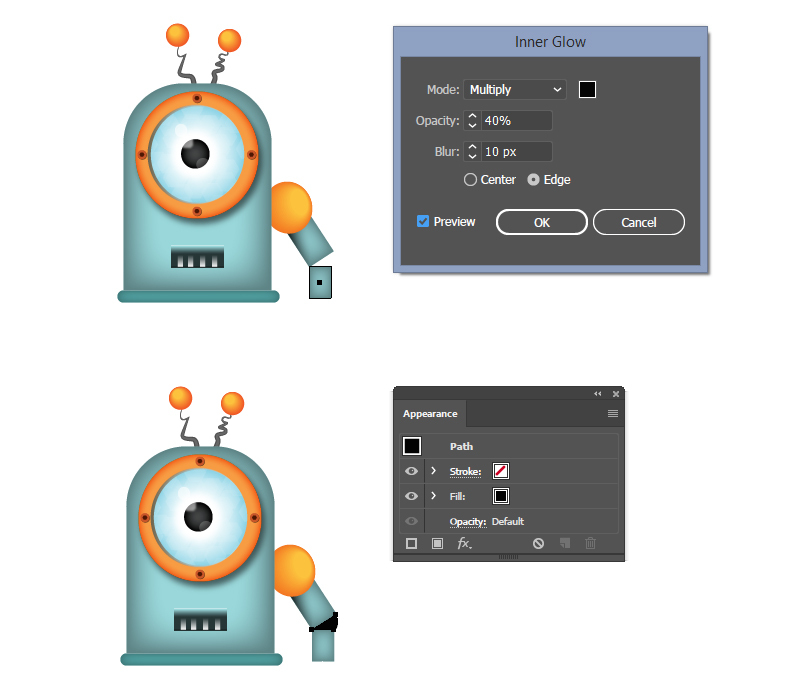 Take the Rectangle Tool (M) and draw a 53 x 20 px rectangle as the mouth of the robot. Color it with dark gray. Copy and Paste in Back (Control-B) this rectangle and change the fill color to black; then move it 1 px downwards by pressing the Down Arrow key on your keyboard once. This will create a shadow at the bottom of the mouth. Draw four small 5 x 12 px rectangles as the teeth and color them with the linear gradient shown. Draw a rectangle at the top of the mouth up to the teeth and color it with the linear gradient shown. Copy and Paste in Back (Control-B) this rectangle and replace the gradient with pale blue; then move it 1 px upwards by pressing the Up Arrow key on your keyboard once. This will create a highlight at the top of the mouth. Use the Pen Tool (P) or the Pencil Tool (N) to draw a path like in the next image as the antenna. 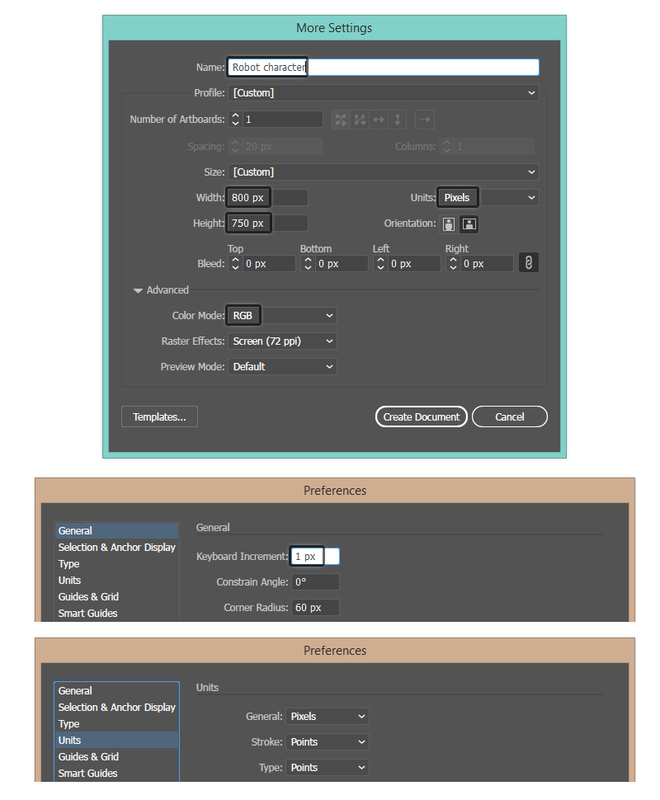 Select a 6 pt gray Stroke and the Width Profile 4 in the Stroke panel. 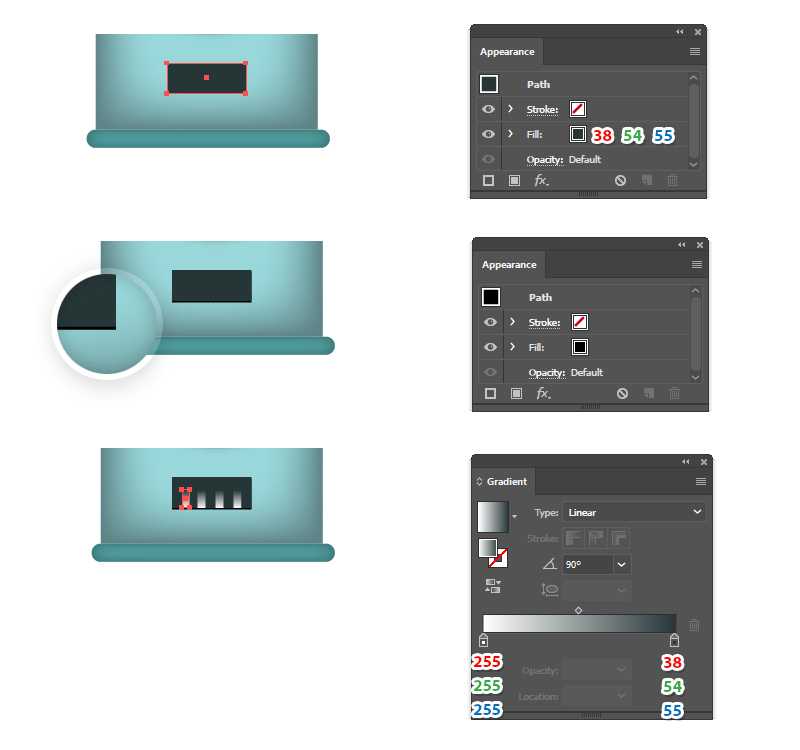 Add a New Stroke at the top of the Appearance panel and select a 3 pt Stroke using a lighter gray and the Width Profile 4. Draw another antenna path and apply the same appearances. Send both antennas behind the body of the robot in the Layers panel. Use the Ellipse Tool (L) to draw a 23 x 23 px circle filled with dark orange at the top of the antenna and then a smaller circle filled with light orange. 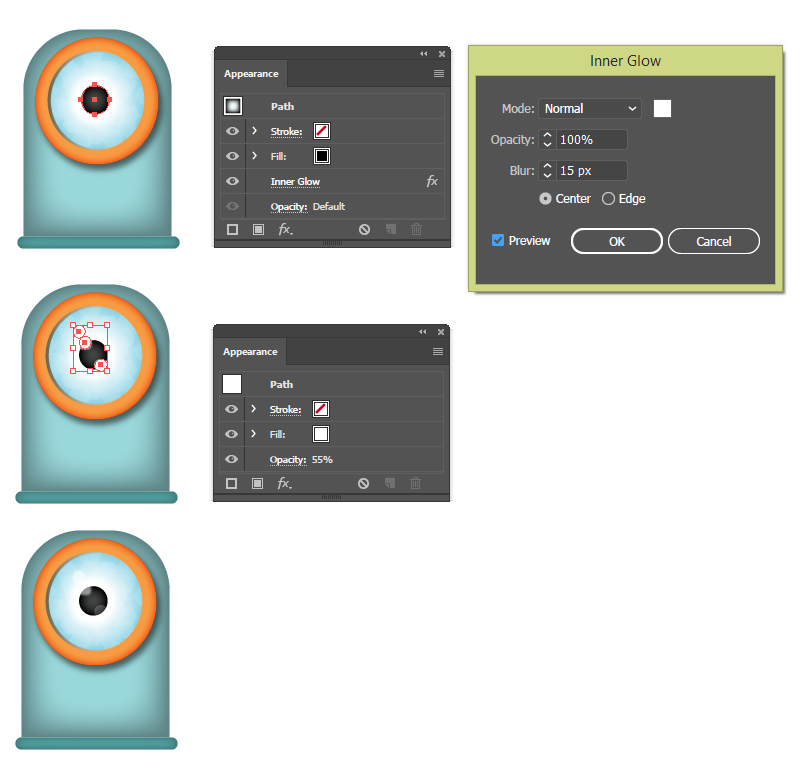 Select both circles, go to Object > Blend > Blend Options and choose 10 Specified Steps. Go back to Object > Blend > Make (Alt-Control-B). Make a copy of the orange ball for the second antenna. We will continue with the arm of the robot. 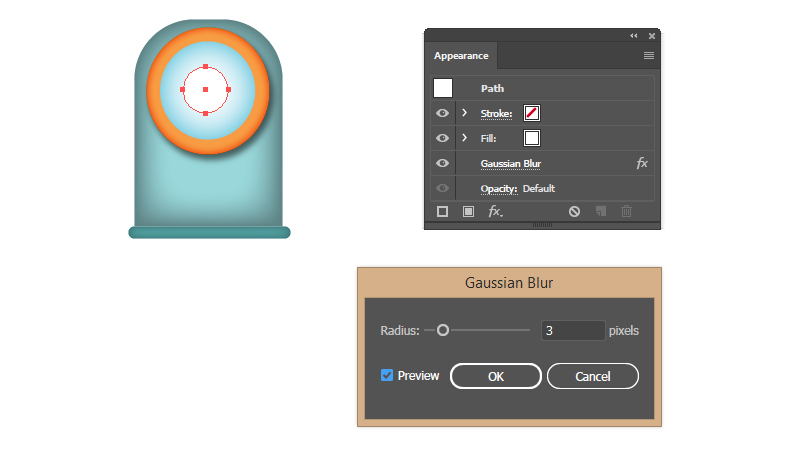 Grab the Ellipse Tool (L) and draw an ellipse in the right side of the body colored with dark orange followed by a smaller ellipse inside it colored with a lighter shade of orange. 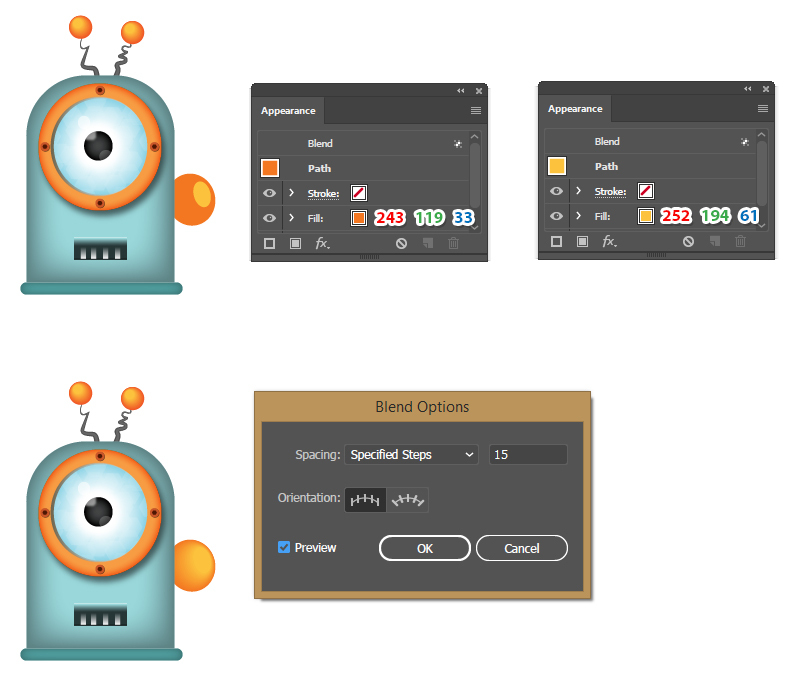 While the two ellipses stay selected, go to Object > Blend > Blend Options and choose 15 Specified Steps; then go back to Object > Blend > Make (Alt-Control-B). The resulting group will be the shoulder of the robot. 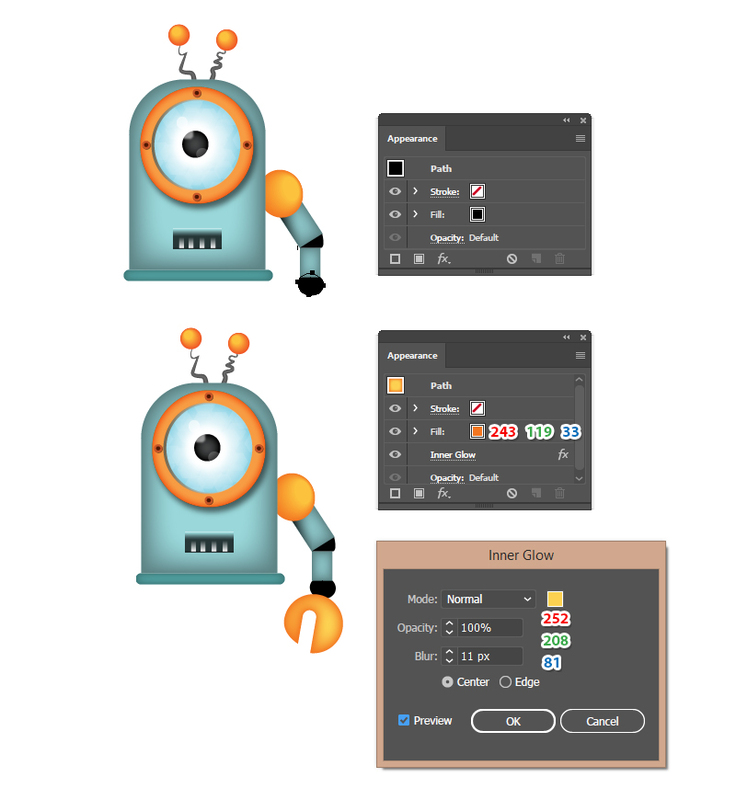 Grab the Rectangle Tool (M) and draw a rectangle of about 44 x 29 px; then Rotate it to obtain the arm of the robot like in the image below. Color it with light blue and then go to Effect > Stylize > Inner Glow and apply the settings shown. Next, take the Pen Tool (P) and use it to draw a triangle-like shape between the corner points of the arm rectangle. Fill it with a white to black linear gradient and adjust the angle of the gradient so the shadow falls in the upper left side of the arm. 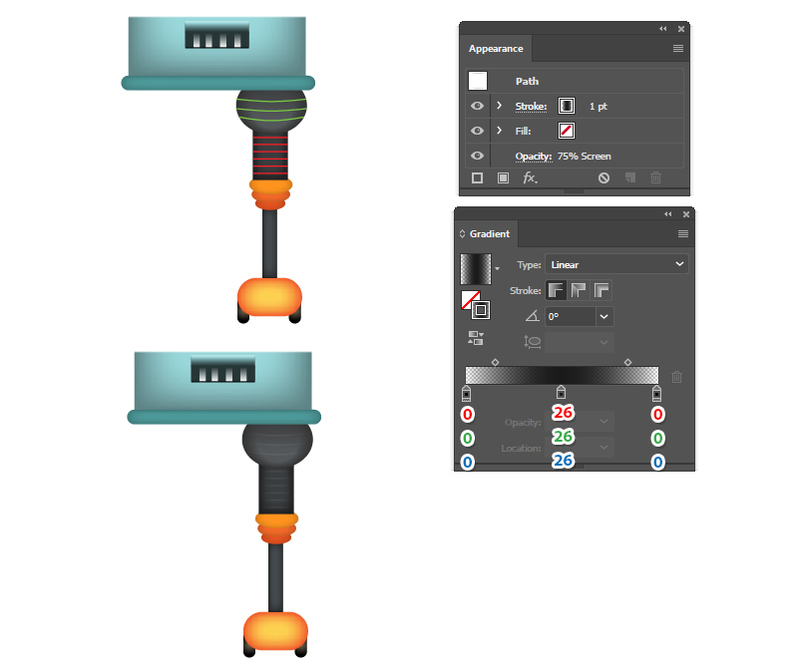 Set the Blending mode to Multiply (white becomes transparent) and reduce the Opacity to 85%. Draw a smaller 22 x 32 px rectangle and align its top left corner point with the arm rectangle. Color it with the same light blue and apply the Inner Glow effect. Now, using the Pen Tool (P) draw a small triangle-like shape between arm and forearm as the elbow. Color it with black. Use the Ellipse Tool (L) to draw an ellipse as the wrist. Color it with black and then send it behind the forearm. Next, draw the hand of the robot in the shape of a wrench. 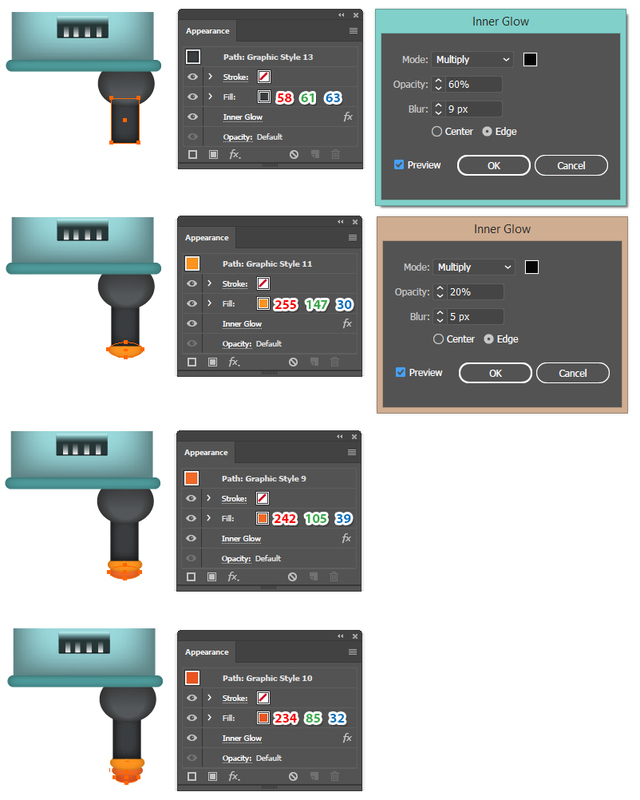 Color it with orange and then go to Effect > Stylize > Inner Glow and apply the settings shown. At this point the entire right arm is ready and you can Group (Control-G) all the shapes. While the arm stays selected, go to Object > Transform > Reflect, check Vertical and hit Copy. You will get the left arm and all you have t do is to move it into place. Both arms of the robot should be under the body in the Layers panel. We will continue with the right leg of the robot. Use the Ellipse Tool (L) to draw an ellipse of about 60 x 48 px; then color it with dark dray and send it behind the body. Switch to the Pen Tool (P) and draw a small half circle at the bottom of the ellipse filled with a lighter shade of gray. 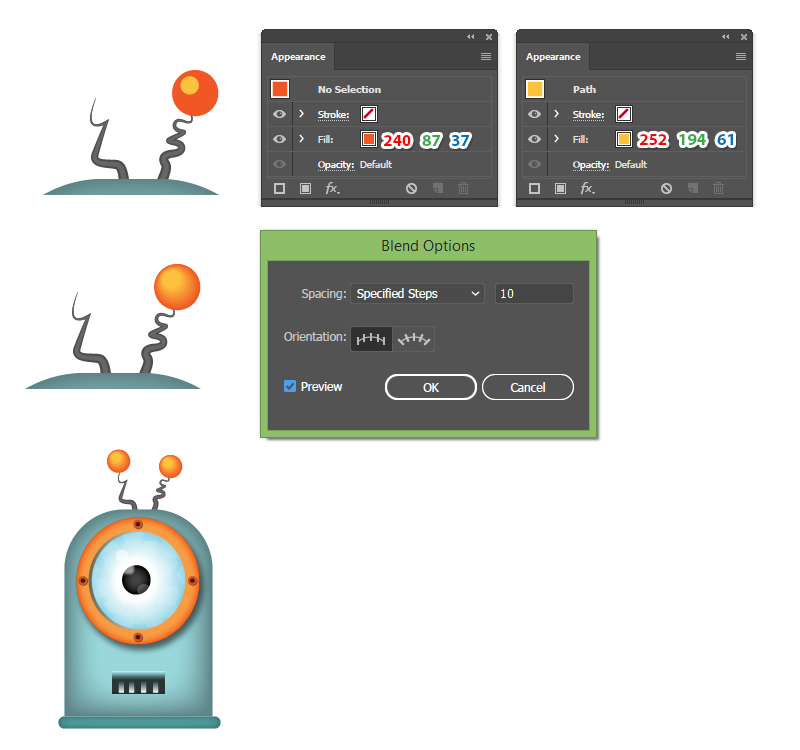 While both shapes stay selected, go to Object > Blend > Blend Options and choose 15 Specified Steps. Go back to Object > Blend > Make (Alt-Control-B). Grab the Rectangle Tool (M) and draw a rectangle of about 30 x 47 px. 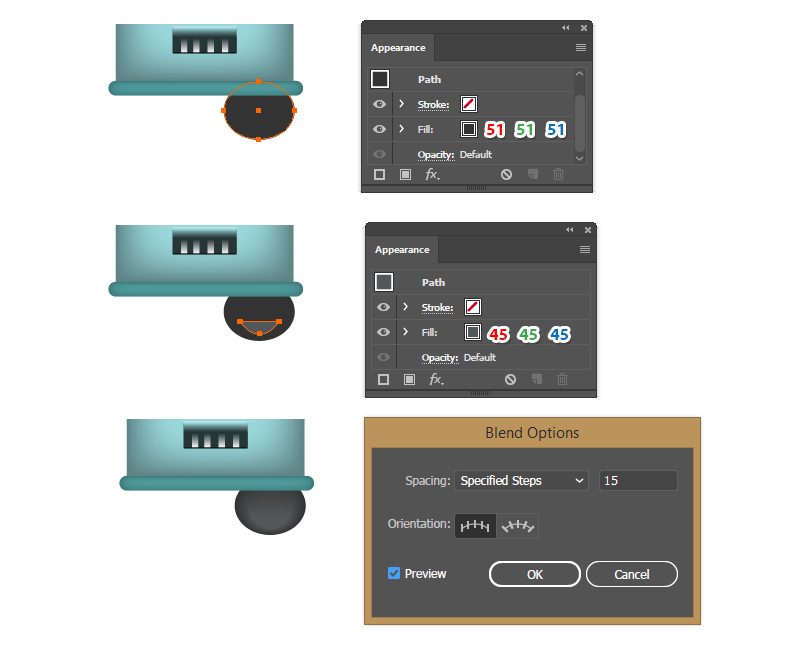 Send it behind the blend-group that you have obtained in the previous step. Color it with dark gray and apply the Inner Glow effect using the settings shown. 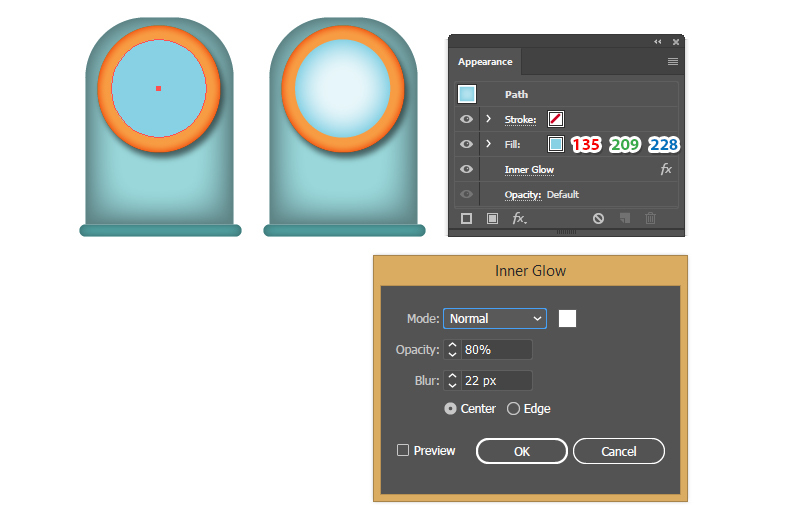 Next, grab the Ellipse Tool (L) and draw three small ellipses next to each other to create the knee. Color them with different shades of orange and apply the Inner Glow effect using the settings shown. Continue with a thin rectangle of about 12 x 58 px. Color it with dark gray and apply the Inner Glow effect again. The next shape is a 54 x 32 px rounded rectangle filled with dark orange. 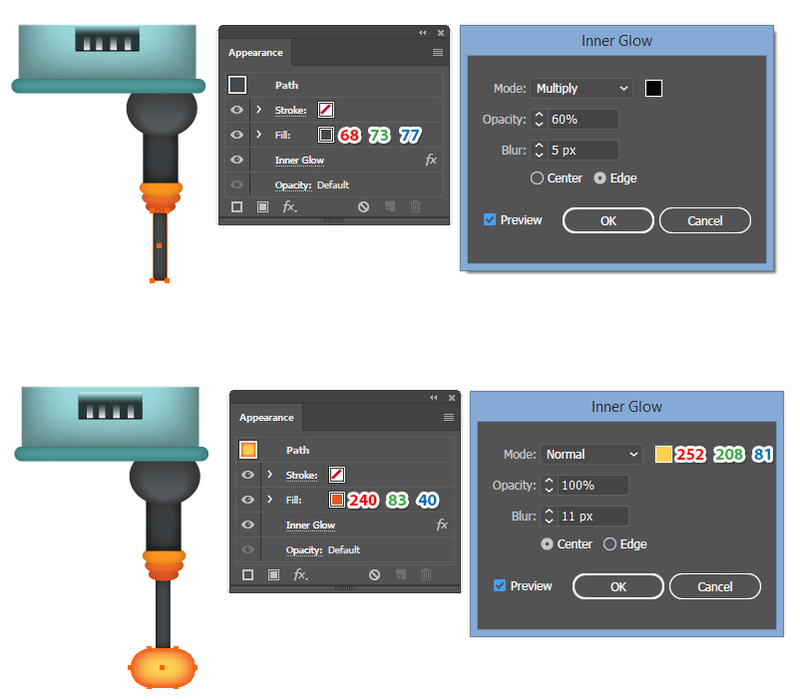 Apply the Inner Glow effect using the settings shown. The final thing are the wheels. They are small 10 x 22 px rounded rectangles filled with the radial gradient shown. Let’s add some details on the leg. Use the Pen Tool (P) to draw a few horizontal lines like in the image below. Give them a 1 pt Stroke and use a linear gradient from black (0% Opacity) to dark gray to black (0% Opacity). Set all of them to Blending mode Screen and 75% Opacity. At this point the right leg of the robot is ready and you can Group (Control-G) all the shapes. While the leg stays selected, go to Object > Transform > Reflect, check Vertical and hit Copy to obtain the left leg. Move it into place and you are done. Here is the final image of the cute robot character. I hope you enjoyed this tutorial and that you learned new things today. I am a hobbyist graphic designer and avid Illustrator and Photoshop user. I like experimenting with vector graphics in Illustrator and less known alternative applications. I am also interested in photography and tech.